The Sun Fire V480 is a high-end, entry-level server. It has up to four UltraSPARC III Cu processors, 32GB of memory, two hot-plug FC-AL disks and many more peripherals. This server gives you great support for processing needs in a small compact space. Request a quote now on Sun Fire Server Models, or contact us at info@vibrant.com or 888-443-8606 with any questions and price requests. 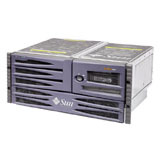 For pricing on new or used Sun Fire V480 servers, upgrades or parts, please contact Vibrant sales at sales@vibrant.com or call 888-443-8606 or 952-653-1700.